I have a small collection of really old buttons. The ones pictured are some of my favorites. I don’t know if I will ever sew them to anything. I can imagine them on various dresses from the 1800’s. I don’t think any are older than that, but I do not know for sure. The Conquistador button in the front is my favorite. There is so much detail in the carving. I asked on the historical knitting forum over at Ravelry about the clothing depicted. 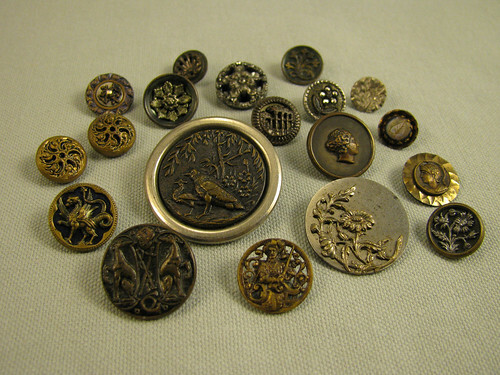 Dawn(dtjacobson) was so nice to tell me this, “There was a period during the 19th century when Elizabethan Revival was very popular, and your button may date from that time.” I keep these buttons and pieces of antique lace in a cedar chest. Writing this blog is giving me a wonderful excuse to look though everything to find things to share. This entry was posted on Monday, November 3rd, 2008 at 3:00 am and is filed under Sewing. Tagged: Buttons, Crafts, Sewing. You can feed this entry. You can leave a response, or trackback from your own site.